Searching for your last activities of 2011? Or something to welcome in 2012? Ring in New Year’s Eve rinkside at Celsius. Limited tickets available here. Pose for next year’s holiday card at the tree. 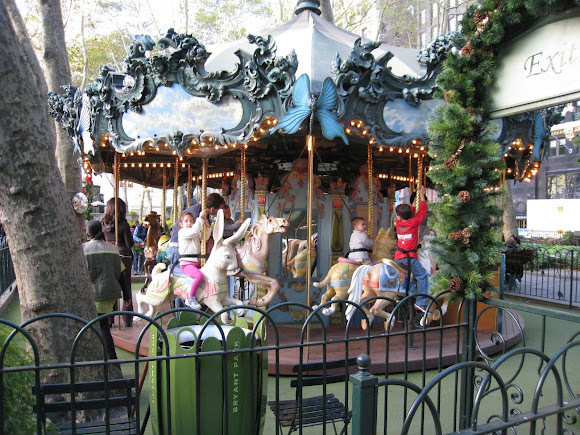 Glide across the Citi Pond ice, stroll through The Holiday Shops, and spin around Le Carrousel all weekend long. Check hours here. Warm up fireside and under the heat lamps at the Southwest Porch. This is an excerpt from Bryant Park's events newsletter, Now in Bryant Park. You can view this week's edition online, or sign up for Bryant Park Events to receive it in your inbox. I love going to Bryant Park!